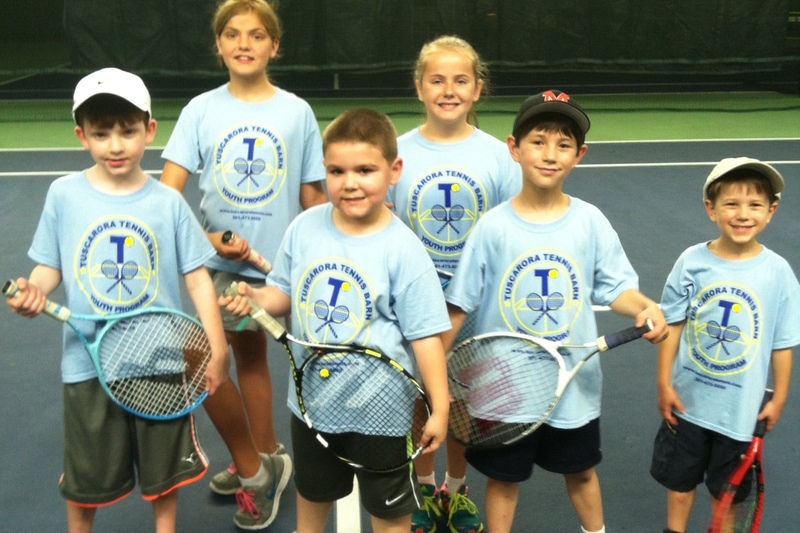 A fun first week of tennis camp for our young beginners. Tuscarora is offering tennis camps this summer in our beautifully updated facility! Our overall goal is to keep kids active and encourage tennis as a lifetime sport of fun and great exercise. Players will enjoy working with USPTA teaching professionals with a variety of partner games, drills, match play and fitness exercises. All players should pack healthy snacks and water bottles for breaks. Also bring a notebook, hat/visor, towel, wristbands and sunscreen. In this camp, we work on all basic tennis skills with upbeat drills and exciting games. We help players develop motor skills needed for different strokes and everyone moves at their own pace based and ability. We use low compression balls, special court lines and size appropriate equipment for children of these ages.The camp emphasizes working with a partner, good sportsmanship and tons of fun! This camp is geared toward higher level drills and developing skills and strategies for singles and doubles match play on a standard size court. Similar goals of team building and sportsmanship are encouraged in preparation for high school tennis and tournaments. More physical conditioning is emphasized to build strength and speed needed for competitive play. These juniors should be committed to tournament competition as this camp is a concentrated program of multiple stroke drills and game play. Players will be recorded for video analysis and evaluate progress from the beginning to the end of the week. The camp addresses advanced match play, strategy, specialty strokes, fitness, nutrition and racquet care. Additionally, pre-match warm ups, stretches and focusing rituals will be covered. Training will be on hard courts as well as Har-Tru (clay) courts.